Raku is just your average Japanese teenager with a crush on a female friend- except, that is, for the fact that he's also heir to a local Yakuza gang. His life changed when he is forced to pretend to date Chitoge- the beautiful daughter of a rival crime family, in order to prevent a gang war from breaking out. As a set up for a rom-com, you have to admit, that's pretty unusual. In actual execution, though Nisekoi: False Love's first season plays out more like a -very well executed- greatest-hits of anime rom-com clichés. Nisekoi's 12 episode second season aired under the title Nisekoi: (complete with a colon,) between April and June 2015. The UK release from Kaze (reviewed here) is released across two volumes on Blu-ray and DVD. 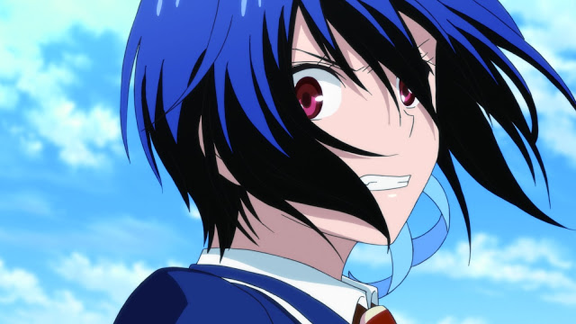 Season 2 picks up where the first season left off, with Chitoge coming to terms with the fact that her feelings for Raku may not be entirely fake after all. 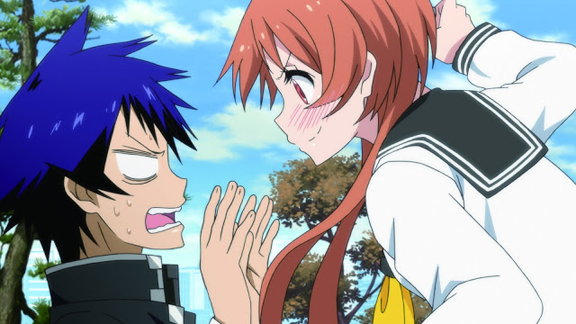 Raku meanwhile is still holding a torch for Onodera, but could his feelings for Chitoge be changing as well? This second season is essentially - for good or ill- more of the same. The organised crime element comes in occasionally to add a slight twist to the formula, but for the most part, if you've seen an anime rom-com before there's little you haven't seen before. 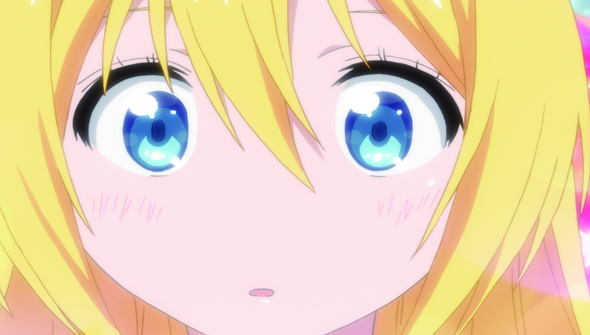 As with the earlier season though, Nisekoi gets by for the most part on its not inconsiderable charms. Its rose-tinted view of teenage life, complete with all-consuming crushes, long summer days and comic misunderstandings continues to be wonderfully evocative. Even characters who are supposed to be hard-edged criminals turn out to be big-hearted, in this sweet-natured series. The series is also lacking in the raunchy side that other similar anime put front and centre. Although not completely devoid of the occasional fan-service focussed sequence, it's notably much less extreme than in some other series you may have seen. Here, even a running gag about a character who keeps accidentally flashing her underwear manages to keep the unmentionables off screen. It all seems very in keeping with the show's primarily innocent tone. SHAFT return on animation duties, and continue to put in impressive work. Bright, colourful and full of character the animation is pleasing to the eye without doing anything overly flashy. There were a few subtle touches to the animation in the previous season that seem missing this time around, but the visuals overall are still of an extremely high quality and consistent too. Storywise, however, the season doesn't offer much progression in the overall plot. It introduces a number of new characters to the mix (including Chitoge's formidable mum and Onodera's protective little sister) but does little to advance the central romantic plot. The characters are in roughly the same place by the end of the season as they are at the start. The reduced number of episodes in the season probably doesn't help. We end up with 12 episodes worth of sitcom-ish antics and little else- and a number of the episodes are split into two, making the stories even less substantial. Which isn't to suggest that the episodes are not entertaining in their own right. There's plenty to enjoy here, and it's all well and good if you enjoy spending time with the characters- but it might have been nice to have a bit more progress in the overall storyline too. Naoshi Komi's original manga came to an end in 2016, so future seasons (if there are any) may be able to bring the story to its conclusion. In the meantime, Nisekoi's second season is an enjoyable watch. It's light, fluffy and sweet as they come- but not an experience that will linger long in the memory.